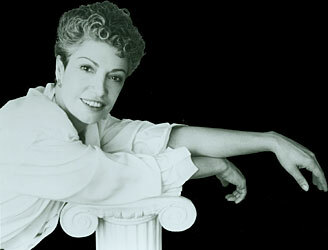 Joelle Wallach’s 1997 Sextet is a work in four movements, each a unique and vivid psychological landscape. 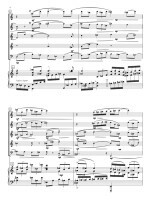 The first movement’s lyrical, wistful, almost weeping lament is followed by the busy weaving motion of the spider-like second movement. 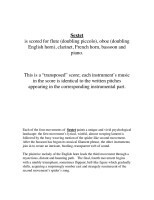 After the bassoon has begun its filament of musical phrase, the other instruments join in to create an intricate, bustling, transparent web of sound. The plaintive melody of the English horn leads the third movement through a mysterious, distant and haunting path. 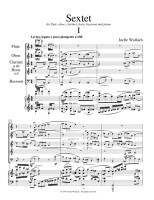 The final, fourth movement begins with a nimbly triumphant, sometimes flippant, bell-like figure which gradually shifts, acquiring a surprisingly somber cast and strangely reminiscent of the second movement’s spider’s song. 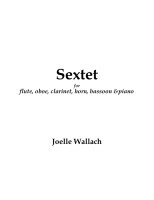 The Sextet is scored for flute (doubling piccolo), oboe (doubling English horn), clarinet, French horn, bassoon and piano, each instrument contributing its characteristic cry as it joins its voice in support of the sonorities of the entire ensemble.